Frederic Malle is now serving body-ody-ody with two incredible body ancillaries to Frederic Malle Cologne Indelebile. Available is a body milk and a shower gel. 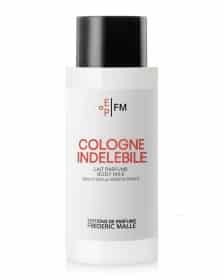 Frederic Malle Cologne Indelebile, launched last year and is a mediterannean-style citrus cologne with lemon, bergamot; a heart of narcissus, orange blossom and neroli with a creamy, musky base. The Frederic Malle Cologne Indelebile Body Lotion, containing macadamia seed oil and silk powder, is great for us guys as it’s ultra-hydrating but non-greasy and sinks straight into the skin, leaving it beautifully fragranced with Cologne Indelebile and retains it’s structure and throw for an incredibly long time. The Frederic Malle Cologne Indelebile shower gel – equally packed full of that thirst-quenching, summer, citrus-goodness – gives a gorgeous cleanse with a rich, gentle lather. Afterwards my whole bathroom becomes a humid cloud of freshness. This article first appeared on MANFACE written by Thom Watson. It was published on Saturday 18th June 2016 and was last updated on Monday 3rd April 2017 at 12:52pm. It's categorised under Citrus Fragrance, Frederic Malle where you'll find more related content.